Carpet-Steamer-Experts Carpet Cleaning offers area rug cleaning services for all types of rugs - oriental, persian, chinese, wool, silk and all other delicate fabrics. Whether you need the carpets cleaned at your home or a pick up service we have a solution for you. Area rug cleaning services from Carpet-Steamer-Experts: Stain removal, steam cleaning, deep shampoo cleaning, pet stain and odor removal, deodorizing, sanitizing, disinfecting and more. We use only non-toxic, child and pet safe products only. Urine and spills are two of the most common reasons to clean area rugs. Urine is the most problematic as it can cause severe discoloration in the rug, and the odor tends to be difficult to remove or hide. Continued wettings can cause the rug to loose strength to the point where the rug cracks and breaks. 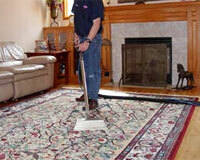 Carpet-Steamer-Experts is dedicated to providing the highest quality area rug cleaning services available anywhere. With professional carpet cleaning technicians and state-of-the-art equipment you can expect fast, quality results and guaranteed satisfaction.